Paper HeARTIST: February's Stamp of the Month...."Home Sweet Home"
February's Stamp of the Month...."Home Sweet Home"
The blog hop makes a circle so if you are starting here just continue until you make your way back and you will have made it through them all. If you have already started and are coming from Sheila Bennett's blog, "Sheila's Stamping Stuff", then you are on the right track. 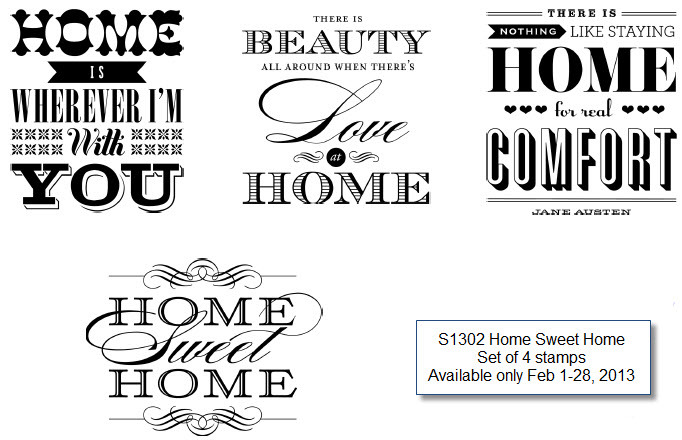 With a stamp set called "Home Sweet Home", a house card is the first thing that came to mind. 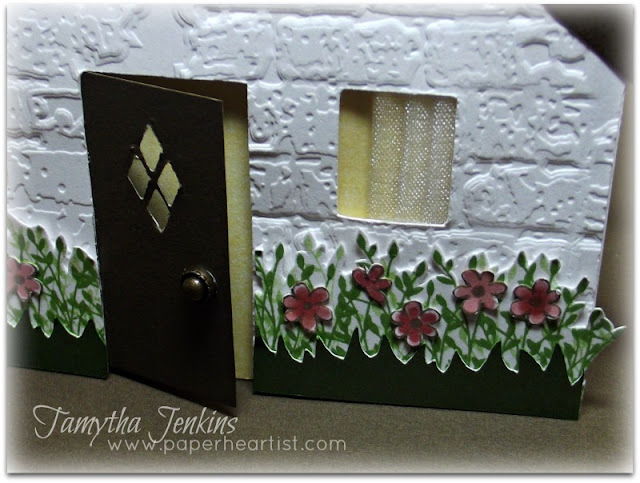 I wanted to figure out how to create a card with the house image on the Art Philosophy image on page 42. So I hooked up my computer to my Cricut Expression and headed on over to the Cricut Craft Room to flip and weld two 4.25" x 5.5" houses together (my first time using this website). I was so excited that it worked! I then reflected back on my love of paper piecing...I used to do that a LOT! A little bit of this, a little bit of that and voila! An adorable little cottage. The grass was cut from the Cricut Artiste cartridge (pg. 73) and the flowers and "shrubbery" are from the A Garden stamp set (#A1119). I used a Tim Holtz Alterations embossing folder to create the bricks. I folded three pieces of sheer ribbon (now retired) in half, lengthwise and glued them to the back of the window to give an illusion of curtains. Cute, huh? I used an old Fiskars hand-held diamond punch to create the window in the door. I cut another house in white daisy and cut 1/4" strips. Then I cut those into smaller strips and lightly sponged Whisper (grey) ink on the edges, glued them down, and then pressed my stylus into the paper to create the illusion of nails. 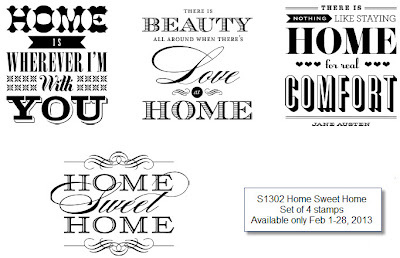 Remember, if you love what you've seen so far along your SOTM Blog Hop journey, and you want your own "Home Sweet Home" stamp set or want to get it for the amazingly low price of $5, be sure to contact your Close To My Heart Independent Consultant. If you don't already have a consultant, I'd love to be yours. You can find details on the "Stamp of the Month" by clicking on the "Promotions" tab at the top of the page or purchase your SOTM here. Of course, if you have any questions, please don't hesitate to contact me. If you have time, take a moment or two to check out the rest of my blog. If you enjoy your visit, then please consider "Following Me", signing up to receive blog updates, and/or leaving a comment (we all love comments...the nice ones anyway), then be sure to continue along on the hop by heading over to Lalia Harris' blog, "Crafty Lalia" and check out her project. WOW, WOW, WOW....You are on a roll my friend! So creative, definitely thinking outside the box! Love the brick embossing and how you welded the house....ooh lala.... fancy-fancy! The bird house, the snowflake card and now THIS! I LOVE it! Thanks for the details. What did you use to make the brick embossing? Love it! You need to quit teaching science and do this full time! Oh Karen. Thanks soooooo much! If you only knew just how bad I want to do just that. In fact, I'm going to go back to school to get a certificate in web development. With the goal to quit teaching and work from home, giving me more time to create and work my CTMH business. 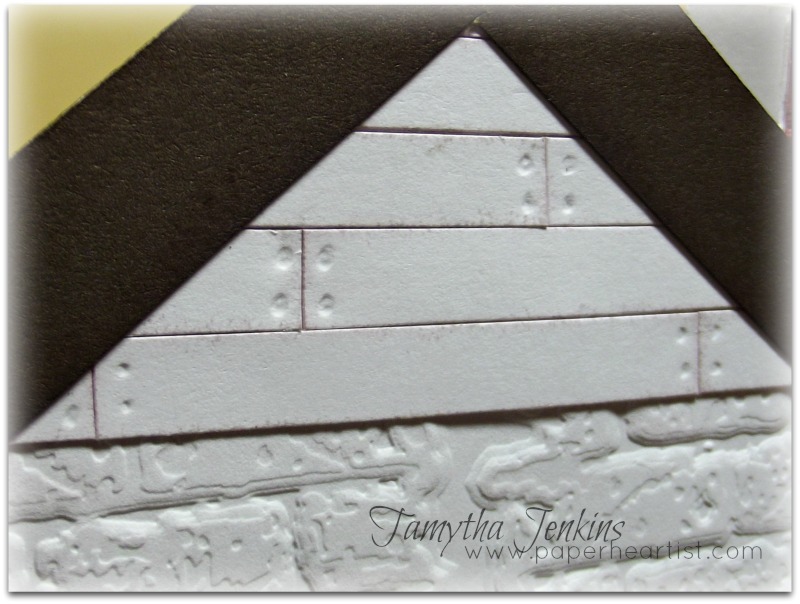 The brick embossing is a Tim Holtz Alterations Texture Fades Sizzix. It comes in a two pack. The other folder is a gorgeous wood grain, which I thought about using, but it's scale was all wrong. Adorable card! I love all the little details!! I agree-- last time the bird house and now this! Love all the details-- especially the curtains and wood on house! What's next? Hey neighbor! Your card is amazing, stunning and beautiful. What an amazing project to cut your teeth on Cricut Craft Room with! It's kinda hard to follow a project like that! Oh my goodness! This is adorable! I love love love all the details!!! Beautiful job! wow! your little house is so detailed! it's just incredible! This is an excellent creative piece of art that should be proudly displayed. I love everything about it. WOWZERS!!! LOVE all the details! Super creative card!! I've been browsing your blog to see what you've been up too and i'm loving all your creations!